Ryan Curtis Jones was a student in the Performing Arts Technology Program at the University of Michigan School of Music, Theatre & Dance from 2002 through 2007. His first computer was an Apple ][e, purchased by his parents when he was seven years old. He learned to program, making simple games and a few noisemaker programs. He became more deeply involved in composing with computers in junior high school using an IBM 386sx and shareware software. After high school, Ryan was employed briefly as a network administrator and spent three years studying Computer Science at Arizona State University. During this time, his interest in computer synthesis and sequencing intensified and he learned of the Performing Arts Technology program offered by the University of Michigan. Through his studies at Michigan, Ryan hoped to gain skills in developing software and hardware tools to help increase the workflow and capabilities of fellow artists and musicians. 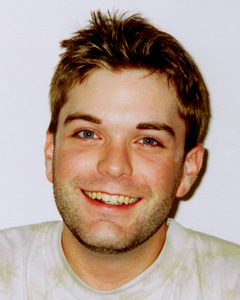 After a long illness, Ryan died on January 25, 2007 in Ann Arbor, MI. Ryan Jones: In Memoriam is a tribute to Ryan's work. It is available for purchase from the iTunes Music Store. Audio previews of all selections are also available in the BlockM Records catalog. Ryan was always generous when it came to helping out those in need. Ryan's parents' wishes are to have the Fund continue that spirit of generosity. All proceeds from downloads of Ryan's works go to the Ryan Curtis Jones Student Assistance Fund. Students who receive support from the Fund use it to pay for books and supplies. If you would like to contribute to the Ryan Curtis Jones Student Assistance Fund, please visit University of Michigan Online Giving; select the "I want to choose" option; and under "View Areas" type "Ryan Jones" in the Other text box.